12 guests only on this amazing 6 night live-aboard tour. 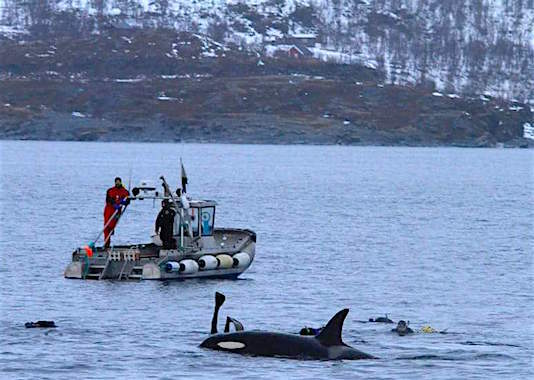 These expeditions offer an amazing chance to spend time snorkelling with these most intelligent and fascinating creatures and experiencing grandeur and beauty of the magnificent fiords of Tromsø. November is herring season and this region becomes host to one of the planet’s largest gathering of orca. Up to 50-60 may be seen at one time – incredible! 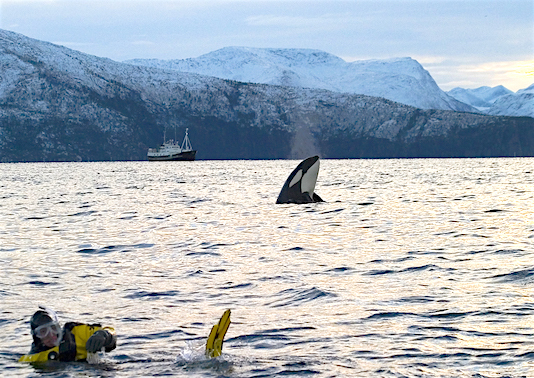 Join us on a wonderful live-aboard safari with the most experienced operator in Norway. Join us with the Legend of the Orcas for this fascinating journey Our wonderful USEA Qualified and renowned Orca Expert, Pierre Robert de Latour will be training you and delivering a fabulous lecture on orca and Annah Evington, our long time WhaleSwim Tonga Tour Leader and ‘passionate about whales’ person, will be leading this tour. 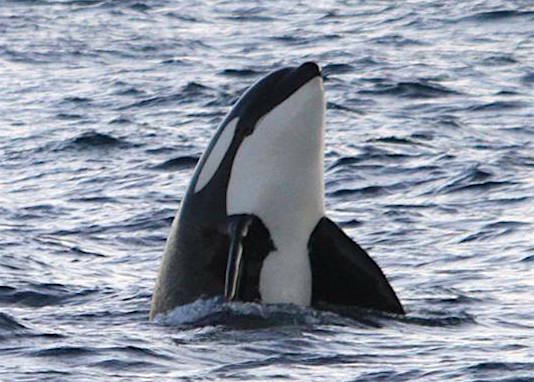 Our main activity will be looking for the orcas and for the opportunity to engage in in-the-water encounters with these amazing creatures (we may well see humpback whales too). The waters are often very clear at this time of the year, and so visibility should be excellent. 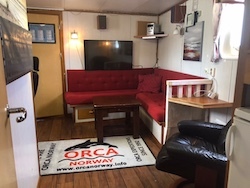 Daylight hours are shorter there and it will definitely be chilly during our snorkelling expeditions from the live-aboard, but the main boat is well equipped for your comfort and the cosy warmth on board straight after our thrilling orca encounters makes it even more special. The tour cost includes the hire of the snorkelling and cold weather drysuit and outdoors protective gear that you will need. Our daily mission: Seeking the herring runs and the orca following them. 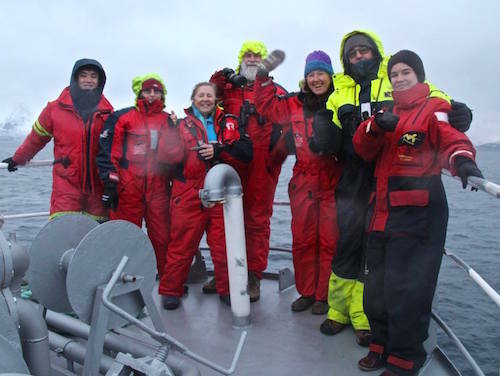 After observing the orca behaviour from the main ship and getting the go ahead from our expert guides we will gear up in our dry suits and move to the tender (zodiac style smaller boat) with cameras ready for photo action. Normally we are in the dinghy two to three hours and then back to the main ship for hot soup, coffee break and lunch. 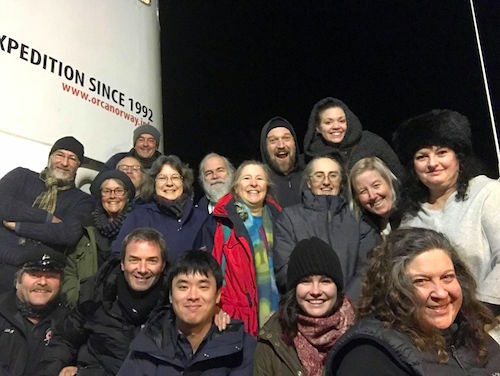 When the darkness folds we go to the closest bay or harbour and anchor up on our cosy mother ship and enjoy hot food, fascinating orca information evenings and the swapping of our many stories! You must be a confident swimmer and snorkeler, with good level of fitness and a strong sense of adventure. You will need to to be agile enough to climb up boat ladders, get into dry-suit gear, climb on and off the smaller zodiac style orca encounter boat and be able to enjoy snorkelling in cold, open water. Our certified USEA guides will teach you what you need to know about being in the water with the orca and you will be shown how to use dry-suits. Tour includes: 6 days live aboard safari and accommodation in a well equipped live-aboard boat. All meals /food, coffee/tea/soft-drinks. Professional chef onboard. All guiding and transport to the field for seeking orcas and large whales. Dinghy with driver and guide. All diving arrangements for free diving and snorkelling are included. Scuba diving also available (for certified divers with at least 30 dives with dry-suit). Tanks, weight-belts, bedlinen and towels included. Snorkelling gear: dry-suit with mask, snorkel, fins and gloves, under-wear, thinsulate, Aquafloat (cover for your body topside for windy and raining weather) all provided. Also included: Wireless Internet onboard. An evening out on the tender with a Hydrophone for listening to the sound of orcas and humpbacks. USEA Lectures with Orca Expert Pierre Robert de Latour – USEA CEO and Co-founder. (Approx one hour each evening). Pick-up service from Tromsø city to the boat. Drop off at Tromsø airport or the designated hotel. PLEASE NOTE: Airfares to and from Tromsø are not included. 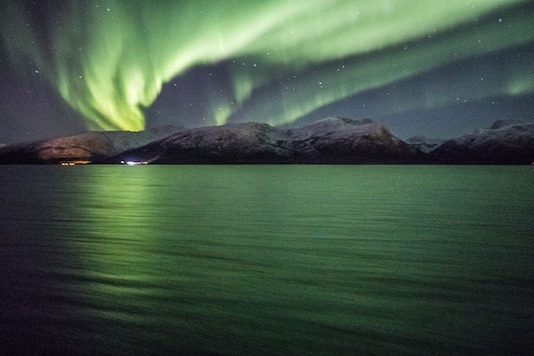 Photo left: The incredible Northern Lights (Aurora Borealis) during November 2017 witnessed my our tours group from the deck of our live-aboard vessel. Where do I fly to: Most will need to fly to Oslo-Gardermoen (OSL) in Norway OR Stockholm Arlanda Airport (ARN) in Sweden and then, generally, a direct flight to Tromsø (TOS). Please talk to us before booking your flights to Tromsø as we have extra information about this. 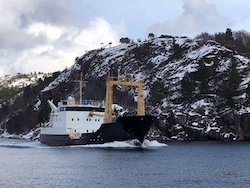 You will need to be at the departure location, in Northern Norway and ready for pick-up from the designated hotel at 2pm on the Saturday of your tour start date – for your transfer to the boat harbour in readiness for our departure on our live-aboard vessel. Your tour will finish back in harbour on the following Friday at 6 pm. Email us at: tours@whaleswim.com for more information. 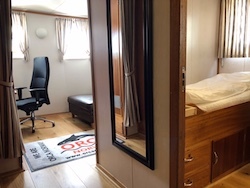 A FABULOUS NEW LIVEABOARD FOR 2019! M/S Villa, 28.98m long, 220 V electricity. This boat is certified for 12 guests and is more equipped the other boat on the fleet. It is modern and spacious, has 6 bathrooms and 6 toilets. Upper deck : 2 suites (1 double bed + 1 single bed with own bathroom) Mid deck : 4 cabins with 2 beds in each and a TV and leisure area. A spacious restaurant with fabulous food! A spacious lounge with 50 seats for lessons and lectures, TV screen, a pub/bar and lounge area. Temperature? Water temperature is about 4 degrees. Air temperature from -7°C up to +7° C.
Daylight? From 10:00 hrs to approx 14:00 hrs. Above: Our happy 2017 tour group & crew on Sula during our tour 11 – 17 November. Below: Our fabulous crew! 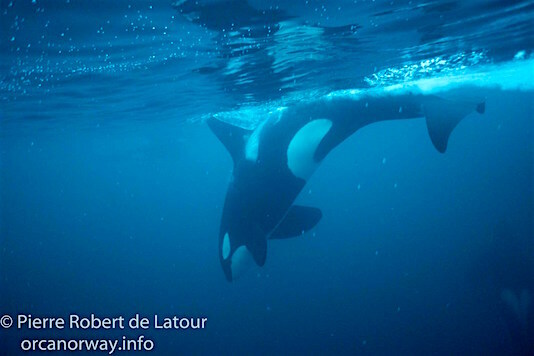 Left: Pierre Robert de Latour – Guide & Orca expert! Centre: Gijs Reitsma – Haarek skipper and ‘GO’! 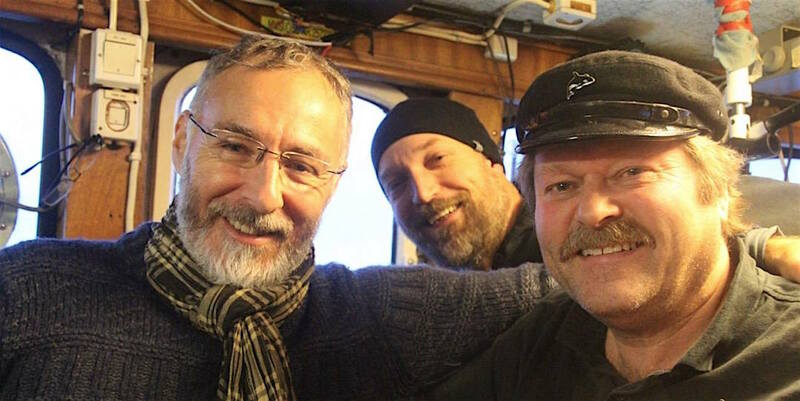 man, Right: Olav Magne Stromshølm – our wonderful Skipper.